Start digitalizing your sales now. Enter the world of B2B E-Commerce in just a few steps with the Klöckner Marketplace - the platform solution for Klöckner online shops. 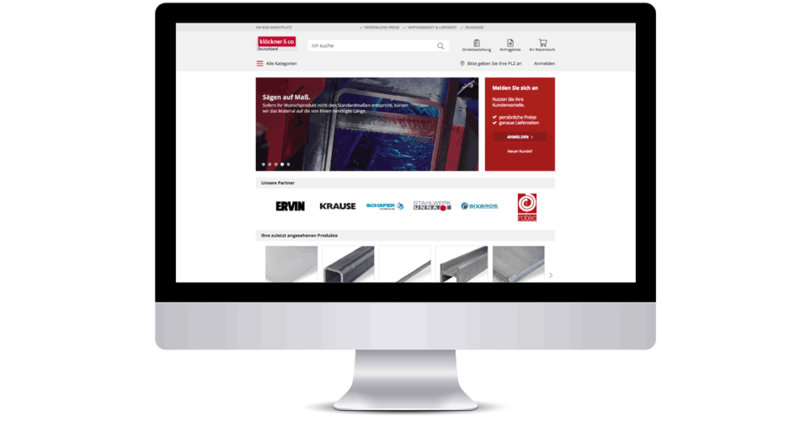 Expand your customer base by 35,000 in the Klöckner online shops registered companies and sell steel, metal and other industrial products matching your range via the marketplace function. It has never been easier to expand your potential customer base to this extent. Not only in Germany, but throughout Europe. We help you to realize your digital sales potential. Our experienced team of developers, marketing experts and account managers ensures a smooth on-boarding process and platform operation. You can focus on your core business and benefit from your new digital distribution channel. Start without much effort in B2B e-commerce. Expand your customer base by over 35,000 registered companies. Benefit from the marketing power - 170,000 shop visits per month. Arrange a consultation today. Simply fill in the contact form. We will discuss all details and general conditions with you in a personal meeting. Contents such as the product catalogue, prices, delivery details and company information will be provided by you for integration. By e-mail you will receive all information about the orders of your marketplace products. In this way you can initiate your order processing as usual.